When everyone's already got a smartphone in a pocket, what good is a portable game console? Figuring that out is one of the toughest challenges for traditional game makers right now. Nintendo's answer is the simplest and best: Just make it nothing like a smartphone. That's worked so far. But the 3DS XL, Nintendo's latest, does share one thing with new smartphones—it's had a growth spurt. Is bigger better? A super-sized version of the original Nintendo 3DS—a two-screen clamshell device with a touchscreen on the bottom and a glasses-free 3D display up top. Anyone who wants to take portable gaming beyond the smartphone standards. A matte cover with a rough black finish inside. The larger screen, compared to the 3DS, means you can hold it farther from your face without feeling like you're staring into a pinhole. While the action plays out on the upper screen, games can use intuitive touch controls on the bottom screen (to trigger a power up in Super Mario Bros. 2, for example, you tap it). The size boost makes for a more comfortable experience overall—no one wants to hunch over a tiny screen. It's easy (and excellent) to be able to chuck in an old DS game, even though Nintendo's onboard software remains in dire need of an update. Launching stuff you already have is fine, but searching for anything new is not easy in Nintendo's eShop. That wasn't a huge deal a few years ago, but with Google, Microsoft, Amazon, and Sony getting their marketplaces in order, Nintendo really has to figure this out. The screen. Sure, it's not as high res as you'd maybe wish for, but that's because it's locked into the same resolution as last generation's smaller screens. The stats are 800x240 for the top screen, and 320x240 for the bottom. The button size and layout. While the 3DS XL's larger size definitely makes it more comfortable to hold than the 3DS, the buttons still feel oddly small. The joystick and directional pad are arranged so you can use either, but that results in neither actually being comfortable. The joystick feels too high, the d-pad too low. Tested over the course of a month. Battery life was unremarkable. Fine for a few hours into a gaming session, but not lasting for days or anything. The 3D on the top screen is still shaky. It's improved overall, just because bigger actually does mean better with 3D screens, but the angle of viewing is still very narrow, and sometimes the effects actually seem to pop more at lower 3D settings. The larger touch screen makes the stylus a little less necessary. With bigger areas to touch, using your finger is an actual option for more things. The onboard cameras are not very good. They produce grainy images, which is mostly fine for AR features, but basically unusable for capturing photos or videos. The 3DS XL is pretty rugged, but its matte finish does pick up scratches more prominently than the shinier 3DS shell. You will never want to put this in your pants pocket when you go out. Use a bag or purse or jacket pocket. It depends. If you've already got a 3DS, maybe not. But if you're looking at the current generation of handhelds, the 3DS XL is definitely the Nintendo device to get. And while it's clearly behind Sony's PS Vita in specs, the two-screen interface offers a totally different experience from that device—or a smartphone. 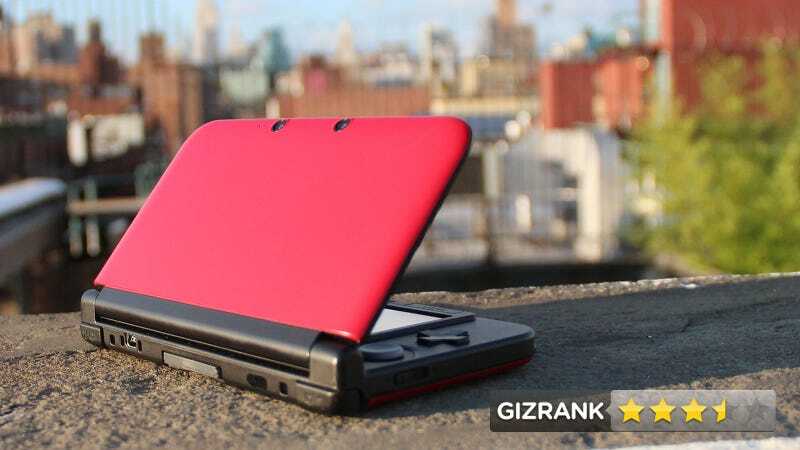 With the dual screen feature and the fact that the 3DS XL is backwards-compatible with an enormous catalogue of older DS games, the 3DS XL is a reasonable thing to buy—even though you've already got a quad-core processor in your pocket.